Expect blood, tears and heart-in-mouth action as explorer Ed Stafford takes on the best explorers in the world in a battle across Discovery's screens in order to be the First Man Out - a show in which survival is only half the battle. Ed Stafford attempts to survive alone on a Desert island for 60 days. With no clothes, no knife or anything except his camera, an emergency satellite phone and an emergency medical kit. 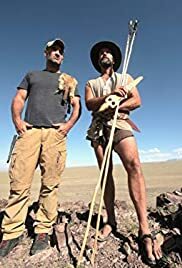 Ed Stafford pushes his survival limits as he tries to survive in some of the worlds' toughest environments without even essential equipment and only a camera by his side. The story of Ed Stafford's 2 1/2 year journey to become the first man to walk the length of the Amazon River. First Man Out is a genre-redefining survival series that pits the world's best adventurers, survivalists and bushcraft experts against infamous explorer Ed Stafford - the first man to walk the length of the Amazon River. Every episode sees Ed Stafford go head-to-head with the best in the survival game in a race across the most stunning but punishing environments Asia has to offer - in a bid to be First Man Out. Ed Stafford has already helmed a host of successful Discovery shows - that have seen him "Marooned" on a desert island for 60 days and "Left for Dead" in hostile locations around the world. This time, survival is only half the battle as Ed risks life, limb and reputation to prove he's the best survivalist in the world. Ed is an amazing host for these kind of survival shows..but this show is so staged that it literally take away any sense of urgency and believability. I've seen sitcom's that felt less scripted, and that's sad because the subject maker is really interesting..but without the "reality" aspect, they're just isn't any substance whatsoever!